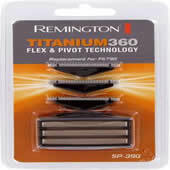 Replacement foil and cutter pack for Remington F5790 shaver. Pack contains the three separate cutter blades and one set of three fixed Remington Foils in a plastic housing ready to clip straight into your shaver. Excellent service although the design of the foil head seems to have changed slightly from the original and tends to come out of the fitting. Excellent service,very fast,easy to use website,what more could you want? Pukka bits, for a pukka shaver, Thanks.